Thanks for the post. Really in the ham diy spirit. 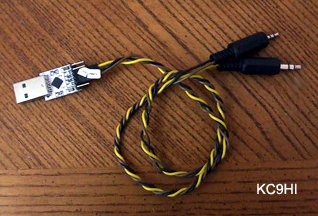 I do homebrew cables in a pinch, but eventually end up needing the USB interface for other projects. I got a cheap premade cable that works with my Baofengs on Amazon. I always check eBay or dx for the interfaces, depending on price and how soon I want it. I do have a question. 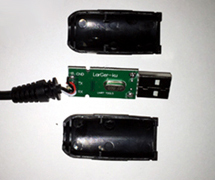 I had a Baofeng cable that gave it’s life attempting to be a rig-control; it appeared to have a (counterfeit likely) FTDI chip and I kind of blew it up when I was trying to pull the RTS pin signal. That’s fine though; I wound up stealing the crystal to stick in a cheap serial-port adapter that has a lovely counterfeit-looking blog on it. Anyway, I’m guessing the Baofengs require TTL logic levels…or do they have some backwards compatibility for 232 levels? Other related homebrewing: I bought a programming cable for my Yaesu FT-817ND and got a cable made for “RT Systems”, a company that distributes control software for different radios like this. I did not buy that software and expected the cable to show up as a USB serial port on my Linux machine. No such luck, it just shows some unknown manufacturer ID and some broken text like “VT Systems CT62C Radio CaGle”. After some peeking I discovered that it is an (apparently real) FTDI chip that has been reprogrammed with different identifiers. It turns out that FTDI distributes a Windows program to do this reprogramming, although unfortunately this program requires a driver for the device to be installed as well. The cable came with a CD with the driver, I installed that on a scrap Windows XP system, ran the program, reprogrammed the FTDI chip to default settings, and now my Linux system recognizes the cable as a serial port and programs like chirp work fine. So what seemed like a bad start ended in success. Interesting. I was also wondering if the inverse would be possible. EG: If one were to buy the RT Systems software, making a cable as described above would work because it would not be dependent on the VID and PID values that are programmed into the proprietary cable. After seeing this post and the a comment (http://chirp.danplanet.com/issues/1209#note-19) from one of the CHIRP maintainers in their bug tracker, I built one of these cables out of the headset that comes with the UV-B5 (the 27-menu-item version) since it’s got that handy two-prong connector. My CP2102 came with pins already on it and a five wires with compatible terminals on them, so I’ve been able to try every combination that makes sense… with no luck so far. CHIRP just keeps reporting that the radio did not ack programming mode. I’ve checked my cable for continuity and that the adapter is firmly seated. Some configurations even cause the radio to transmit when I try to read from it. Has anybody else experienced any trouble along these lines? Has anybody got a UV-B5 lying around and can confirm that this does actually work for it? The only three pins on the CP2102 you need are the GND, TxD, and RxD. 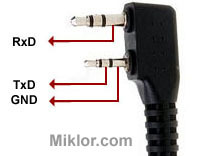 It is possible the Spkr/Micr cable you are using does not have one of the contacts needed. The center ‘ring’ on the 2.5mm jack is used for Data transfer from the radio. There is no need for that on a Spkr/Micr. I would check continuity on the cable to make sure that ‘ring’ contact is actually part of the cable. I had typed out a post saying how I’d already checked continuity thank-you-very-much and that it wasn’t working in spite of that, but a tinge of doubt had me recheck it just now and it looks like you’re right. Of the three conductors on the smaller pin, it looks like the available options are tip and base – the center conductor isn’t connected and I didn’t even notice. I ordered a data cable yesterday and (thanks to Prime), it should be here tomorrow. Thank you for encouraging me to recheck my work. Excellent. Glad I was able to assist. Please let us know how the project turns out. Please. Tell Hans we’re all thinking of him and wish his family well. Baofengs own software does work on both ! Chirp live Linux CD works btway also ..
My own installed Linux mint does not . working in win7 with chirp! and Baofeng original software stil works. Chirp live cd does work. also. only.. my installed Linux mint gives ack mode error, but that can also be due to tweaked OS problem hi! staged by Army and Air Force MARS from 1200Z on Nov 7 through 2359Z on Nov 11. ARES members to also be operating on emergency power as well. or modes are available yet. When they become available, I will pass them along. Please forward this information to all ARES members in each of your counties. I encourage participation in this exercise, using emergency power if possible. Encourage your ARES members to participate as well. I intend to participate myself, using emergency power. as I know what they are, I’ll be passing that information along. It’s been quite some time since we’ve heard from Hans. I hope he and his family are doing well. This is an interesting post that had me ordering some of these boards, and pondering some questions regarding proprietary cables made from the FTDI Chip. My first thought was, “does the CP2102 board ignore the VID and PID values”? Next, I wondered, FTDI has a free download of a utilities for Windows that will allow changing the USB serial chip’s VID and PID, and another utility that will allow editing the driver .inf files to change them there. The difference between proprietary cables and the generic ones are derived from these two values. It makes one wonder if it’s possible to program different VID and PID values into this chip in order to make your own backup to your existing proprietary cable. The CP2102 board uses a SiLabs (Silicon Labs) UART chip (not FTDI or Prolific) so the VID and PID never come into play. It loads its own driver and is Plug and Play.